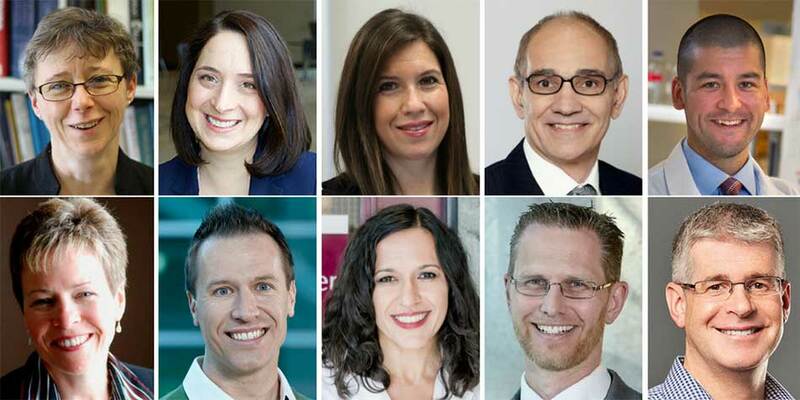 Recognized as leaders in their fields, 10 McMaster researchers have been awarded $8.6 million from the Canada Research Chairs (CRC) Program to further their work, improve Canada’s international competitiveness, and train the next generation of leaders. This latest round includes both new and renewed chairholders. Rob Baker, McMaster’s vice-president of research, says this round of CRCs is remarkable, both in talent and in breadth – covering everything from Indigenous well-being and innovation to human and environmental health. Emily Cranston, associate professor, chemical engineering, is the Canada Research Chair in Bio-Based Nanomaterials (Tier 2). Emily uses biological components to develop environmentally friendly, high-performance and advanced materials from renewable resources like wood pulp with a focus on using nanocellulose. Her research will overcome barriers in the application and commercialization of nanocellulose and other bio-based nanomaterials, enabling widespread use in industries such as food, cosmetics, pharmaceuticals, packaging, paints, adhesives, and oil & gas. Chelsea Gabel, assistant professor, health, aging and society, is the Canada Research Chair in Indigenous Well-Being, Community Engagement and Innovation (Tier 2). She’s partnering with Indigenous communities to explore and address health and well-being issues, and examine the impact of digital technology in these communities. Her research will help create initiatives to improve the quality of life among Indigenous communities and across many generations. Jeremy Hirota, assistant professor, medicine, is the Canada Research Chair in Respiratory Mucosal Immunology (Tier 2). Jeremy is using translational research methods to explore the role of ATP-binding cassette (ABC) transporters in mucosal immunology. His research will provide a new understanding of ABC transporters in lung health, contributing to the development of new and innovative treatments of respiratory diseases such as asthma. Jonathan Schertzer, assistant professor, biochemistry and biomedical sciences, is the Canada Research Chair in Metabolic Inflammation (Tier 2). He’ll use experimental and preclinical methods to understand the links between immune and metabolic systems, to improve existing treatments, and lead to the development of new treatments, for obesity-related metabolic diseases like pre-diabetes and type 2 diabetes. Dr. Ryan Van Lieshout, assistant professor, psychiatry and behavioural neuroscience, is the Canada Research Chair in the Perinatal Programming of Mental Disorders (Tier 2). He’s applying observational and experimental methods to examine pre- and early post-natal stressors and their impact on brain development, to provide a better understanding of how psychiatric disorders develop, and will aid in the creation of early interventions to reduce the risk of these disorders across the lifespan. Mike Waddington, professor, geography and earth sciences, is the Canada Research Chair in Ecohydrology (Tier 1). He’s conducting field research experiments and laboratory studies to examine how drought and wildfire severity impact peatland ecosystems. His work will boost the current understanding of the resilience of peatland ecosystems to climate change and will develop innovative ecosystem restoration technologies for damaged ecosystems. Tier 1 Chairs, tenable for seven years and renewable for an additional term, are for outstanding researchers acknowledged by their peers as world leaders in their fields. For each Tier 1 Chair, the university receives $200,000 annually for seven years.